I haven’t written in a while. Mela and I have been so busy with life. I didn’t even get to send out a Christmas letter this year – I am very sorry. I didn’t get to a Christmas letter for two reasons: we were busy and I have been so uninspired of late. It seems like a funk has settled itself upon me for the last few weeks. Well it’s time to put an end to it! I have been pondering the actual funk itself and its source. I noticed other people have been afflicted by this funk. I feel it in myself and I feel it in others. There is a funk out there and I have been struggling to put my finger on it. Let me tell you what I mean when I say “funk”. A funk is a state where you really don’t want to do anything. Nothing sounds fun. Everything requires too much energy to do. Even things that were fun seem to just take too much energy. You end up sitting in front of the TV or the computer and just do nothing. 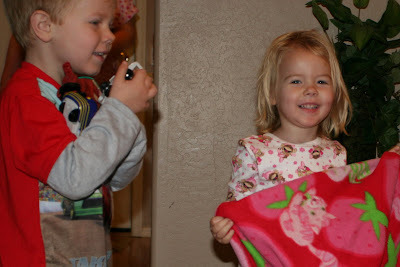 Andrew and Jaedyn are at the age where they are fully immersed in the magic that is Christmas. Nothing equals the look on my kids faces as they came downstairs on Christmas morning. I love my sweet children!! We finally got our big screen TV – it is super cool. Let me tell you how we got it. In the Christiansen household we've been in get-our-financial-house-in-order mode for the last few months. We didn’t want to put a 42 inch TV on a credit card and we didn’t have cash just laying around. Mela had the brilliant idea of counting our change. We had a 5 gallon water jug about 2/3s full of change. I called my bank and asked them how to handle about 75 pounds of change. The bank gave us these big pouches where we could put the uncounted change; they would count it for us and deposit it into our account in a couple of days. We ended up with $787.13 in change! It turns out we did have cash just laying around. Mela rocks!! We ended up buying a $800 42inch Vizio at Costco. Super cool. On another note I made another impulse purchase (so much for the get-our-financial-house-in-order mode). So, we have this really neat TV... My iTunes (the program I love to hate) library has several gigabytes of movies, TV shows and music. My iTunes library lives on my computer downstairs in my Man Cave. I stopped at the Apple store at the Biltmore the other day and bought an Apple TV. The Apple TV is the bomb!! Everything in my iTunes library is now accessible upstairs on the Vizio now. If Andrew wants to watch Cars for the millionth time we can just pull it up on the Apple TV. If I want to watch the Matrix trilogy naked and eat Cheetos, I can do it with just a couple of clicks.